CyberAir 3PRO CW is the result of consistent further development of our thoroughly successful CyberAir 3 series. With our CyberAir 3PRO CW units, STULZ is introducing a new series of units offering maximum potential savings. The units control the climate in the data center with the utmost precision, reliability and energy efficiency. The CyberAir 3PRO CW units are optimized for energy efficiency, low fan power consumption and "modern" high air and water temperatures. The six sizes vary in width from 950 to 3,350 mm. STULZ Indirect Dynamic Free Cooling achieves up to 60 % more savings. 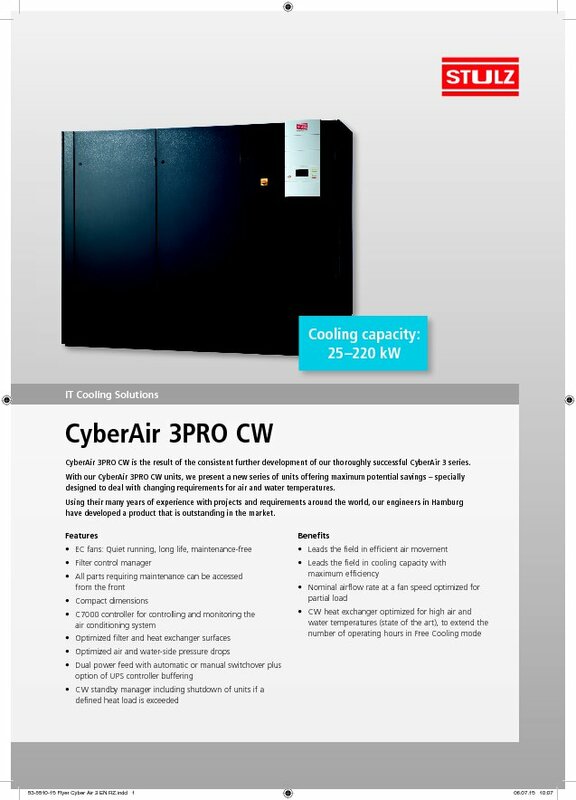 The CyberAir 3PRO CW precision air conditioning system with Direct Free Cooling air conditions Data Centers up to 90 % more economically than conventional compressor cooling systems. "Energy efficiency and reliability are the chief requirements for all Data Center operators. The CyberAir 3PRO CW has been developed to satisfy both these requirements." We offer individual system solutions that are specially tailored to your project requirements. Choose your system. The CyberAir 3PRO CW is available in upflow, downflow, raised floor and high versions. Direct Free Cooling for London's IT. In 2015, the STULZ CyberAir received the IT INNOVATION AWARD. The panel of experts from the Medium-sized Enterprises Initiative named the CyberAir the BEST OF 2015 in the "Green IT" category.